Stella Arnaldo's Blogspot: Oh my goodness! Cookies! MY vegetarian friend Shai Tamayo is offering healthy options for your Christmas gift-giving. 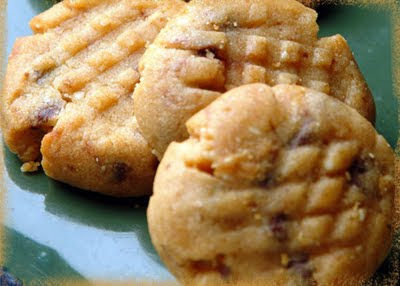 She and her family make cookies made of nutritious, and virtually fat-free, ingredients like whole wheat flour, oats, low-fat yogurt, organic muscovado sugar, nuts and fruits, etc. While I have yet to taste her treats, I just think these make great gifts to our friends and loved ones who are on strict diets to control their caloric intake, their blood pressure, and other diet-related illnesses. I, for one, usually have difficulty thinking of what to give my diet-restricted close friends afflicted with hypertension and diabetes. So next time I visit the Salcedo Market, I will surely drop by Shai's stall, My Goodness. Below is Shai's latest announcement on Christmas gift boxes. To know more of Shai's healthy treats, please visit My Goodness. 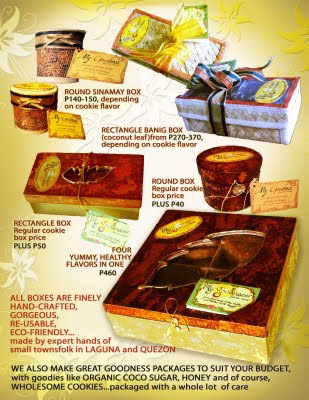 She also sells organic rice, and organic coco sugar, etc., w/c you can buy in those beautifully crafted boxes from Laguna.